Peter David Schiff (/ʃɪf/; born March 23, 1963) is an American libertarian, stock broker, financial commentator, and radio personality. He is CEO and chief global strategist of Euro Pacific Capital Inc., a broker-dealer based in Westport, Connecticut. He is the founder of Euro Pacific Canada Inc., now known as Echelon Wealth Partners Inc., headquartered in Toronto, with offices in Burlington, Ontario; Montreal; Vancouver; and Tokyo. He is also the founder and chairman of Euro Pacific Bank, offshore bank founded in St. Vincent and the Grenadines, relocated to San Juan, Puerto Rico in 2017; founder, CEO, and chairman of Euro Pacific Asset Management, LLC., an asset management company founded in Newport Beach, currently relocated to Dorado, Puerto Rico, since 2013; and founder and chairman of SchiffGold, a precious metals dealer based in Manhattan. Schiff is the principal host of The Peter Schiff Show podcast, which was formerly broadcast on terrestrial and Internet radio, and he was formerly host of an Internet podcast called Wall Street Unspun, now archived as podcasts. He has appeared as a guest on numerous business and financial television shows and has been quoted in major print publications as a financial analyst. Schiff has repeatedly held bullish views on long-term investments in foreign stocks and currencies in countries with sound fiscal and monetary policies, as well as global commodities including physical precious metals and has expressed bearish views on the US economy and the US dollar. Schiff voices strong support for the Austrian School of economic thought, which was introduced to him by his father, Irwin Schiff. In 2010, Schiff ran in the Republican primary for the United States Senate seat in Connecticut, but he lost to Linda McMahon and came in third. Schiff was born to a middle-class Jewish family in New Haven, Connecticut. His father, Irwin, the son of Jewish immigrants from Poland, served in the US Army during World War II. Irwin was a prominent figure in the US tax protester movement, who died in federal prison in October 2015 while he was serving a sentence of at least 13 years for tax evasion. His parents divorced when he was young, and he moved around the country with his mother and his brother, Andrew, from Connecticut to Manhattan to Florida and finally Southern California. He credits his father for introducing him to the Austrian School of economic thought. Schiff was educated at Beverly Hills High School and obtained a Bachelor of Science with a double major in finance and accounting from University of California, Berkeley, in 1987. On October 20, 2015, Tax Notes Today reported that Schiff accused the Federal Bureau of Prisons of inhumanely treating his father, who had died in prison four days earlier, and not allowing the usual humanitarian release. Schiff began his career as a stockbroker at a Shearson Lehman Brothers brokerage in the early 1990s. In 1996, Schiff and a partner acquired an inactive brokerage firm, renamed it Euro Pacific Capital, and began operating it from a small office in Los Angeles, relocating the firm to Darien, Connecticut, in 2005, and later to Westport, Connecticut where it is currently headquartered, with branch offices across the US in Scottsdale, Arizona, Boca Raton, Newport Beach, Manhattan Beach, California, and New York City. It specializes in non-US markets and securities. Schiff founded Euro Pacific Bank, a full reserve banking operation originally in St. Vincent and the Grenadines, The bank operates on basis. relocated to San Juan, Puerto Rico in 2017. He also founded SchiffGold (originally Euro Pacific Precious Metals, LLC), a precious metals dealer based in Manhattan. In an August 2006 interview, Schiff said, "The United States is like the Titanic and I am here with the lifeboat trying to get people to leave the ship.... I see a real financial crisis coming for the United States." On December 31, 2006, in a telecast debate on Fox News, Schiff forecast that "what's going to happen in 2007 is that real estate prices," which had peaked in December 2005, "are going to come crashing back down to Earth." In his 2007 book Crash Proof, Schiff wrote that US economic policies were fundamentally unsound. Since then, he has stated many times that without a change in US government economic policy, there will be hyperinflation and that the imbalance between the amount of goods the US consumed and what it produced would eventually lead to problems for the US economy. As a remedy, he favored increased personal savings and production to stimulate economic growth. Schiff cited the US's low personal savings rate as one of the causes of its transformation from the world's largest creditor nation in the 1970s to the largest debtor nation in 2000. He attributed the low savings rate to what he asserts are high inflation and artificially low interest rates set by the Federal Reserve. In 2008 and 2010 appearances on Fox News and financial news network CNBC, Schiff mentioned factors such as speculation and "the absence of lending standards" as factors that had contributed to the housing crisis, which began in 2007. On December 13, 2007, in an interview on the Bloomberg TV show "Open Exchange," Schiff added that he felt that the crisis would extend to the credit card lending industry, and he called consumer credit "a cancer on the free-market economy." Schiff said that interest rates would rise, that the dollar would "collapse," and that all classes of dollar-denominated assets would fall in value relative to non-US assets. He predicted "a huge crisis" and "the blow-up of credit card finance" in 2008, with the result that consumer credit card spending limits would be "slashed" by card issuers. He added that Americans would no longer be able to make purchases using their credit card lines. Eight years later in 2016, this prediction is still unrealized. Referring to the housing market, Schiff went on to criticize the policy of the Bush administration to "vilify and threaten the lenders" for reckless borrowing. In a March 2009 speech, Schiff said that it would be impossible for the US public debt to China to be repaid unless the US dollar's value is substantially diluted through inflation. In September 2009, with gold below $1,000 per ounce, Schiff said that he foresaw gold at over $5000 per ounce in the future, and that the stock market rally which began that year was a "rally in a bear market." As of 2016, the price of an ounce of gold has always been less than $2,200 and typically under $1,500. Schiff believes that there should be no minimum wage. He believes that minimum wage laws hurt the poorest and least skilled by pricing them out of the job market and reducing their opportunities to acquire the skills which would make them more employable. While speaking at the Yale Political Union in September 2017, Schiff said "[the minimum wage] limits the ability of the worker to sell his labor... the government sets an arbitrary [price] floor - and let's say the minimum wage is $10 an hour - what the government is saying is if you cannot sell your labor for more than $10 an hour it is illegal for you to accept employment." He believes that raising the minimum wage to $15 an hour would have devastating economic consequences and destroy job opportunities for poor, low-skilled workers. Schiff stated "it's not a question of having a job at $7 an hour versus $15 an hour, it's you can be employed at $7 an hour or unemployed at $15 an hour. What good is it to be unemployed at $15 an hour? And the real damage though is not necessarily to that job, but it's knocking off that bottom rung of the employment ladder. Because if you're taking a lot of these young kids, and you're permanently barring them from the labor market, and they never get to get on the first rung, then they never get to climb up, they never get to earn the higher amount of money". During a January 2014 appearance on The Daily Show, correspondent Samantha Bee asked Schiff to provide an example of "a person whose work would be worth $2 an hour." Schiff remarked that some "mentally retarded" persons are happy to find work, even at just $2 an hour. Despite the fact that mentally handicapped people are already not subject to minimum wage laws thus making as little as $2 per hour, Schiff was heavily criticized for what his opponents perceived as a suggestion rather than an explanation of existing reality. He claimed that his remarks were taken out of context by splicing different parts of a four-hour interview, which included criticisms regarding the use of unpaid interns by The Daily Show as well as the US Department of Labor's exemption of developmentally disabled persons from the minimum wage. In March 2011, Schiff stated that a national sales tax should replace both personal and corporate income taxes, as he believes that the latter discourages work as opposed to a consumption tax. Schiff's second choice is a flat tax rate, which would abolish all deductions including the very popular home mortgage tax deduction, as Schiff believes that the state should not subsidize buying homes as opposed to renting. On February 12, 2015, Schiff stated, "The degree of debt we have, the degree we are dependent on artificially low interest rates which are obviously unsustainable and the massive trade deficits we have chronically year after year.... These are growing problems that are ultimately going to lead to a U.S. dollar crisis." In August 2012, Schiff criticized Paul Ryan's Path to Prosperity by saying that it is "too little, too late." Referring to Ryan's plan to save Medicare, Schiff said, "Why would we want to preserve it? It's a Ponzi scheme... What we really need is real Medicare cuts today for people who are already on the system." Schiff is known especially for his bullishness on gold and his belief that gold will protect investors against a prolonged decline of the US dollar. He introduced the first 100% physically backed gold/silver accounts integrated with the global debit card system back in 2011 through Euro Pacific Bank Ltd, his offshore bank. Schiff is uncommon among highly visible libertarians in that he is uninterested in Bitcoin; he has been called a "Bitcoin skeptic." He initially claimed that the cryptocurrency has no intrinsic value, and has since maintained that it has no significant competitive advantage over other cryptocurrencies, and so cannot be an effective long-term store of value. At times he has remarked that he sees it not as an alternative to gold but more as resembling the tulip mania bubble. Schiff considers it as a payment method rather than a currency, the latter of which should be able to hold its value. However, he understands "the value of the technology as a payment platform," and his Euro Pacific Precious Metals fund partnered with BitPay in May 2014 because "a wire transfer of fiat funds can be slow and expensive for the customer." Schiff's warnings of a coming economic collapse earned him the moniker "Dr. Doom", but later articles in Business Week and other business news journals reported that Schiff "more or less accurately" predicted the financial crisis of 2007–2010 while the "easiest criticism of macroeconomists is that nearly all failed to foresee the recession despite plenty of warning signs." A YouTube fan video, "Peter Schiff was right," became popular in late 2008 and 2009. It contained a compilation of his appearances on various financial TV news programs between 2005 and 2007. Depending on the point at which they adopted his strategies, followers of Schiff may have had strong, average or poor returns. In January 2009, economic blogger and investment adviser Michael Shedlock wrote, "I have talked with many who claim they have invested with Schiff and are down anywhere from 40% to 70% in 2008." Later that week, an article appeared in the Wall Street Journal reporting that Schiff's broker-dealer firm had "advised its clients to bet that the dollar would weaken significantly and that foreign stocks would outpace their U.S. peers" but the dollar later advanced against most currencies, "magnifying the losses from foreign stocks." In response to Shedlock's criticism, Schiff wrote that "to examine the effectiveness of my investment strategy immediately following a major correction by looking only at those accounts who adopted the strategy at the previous peak is unfair and distortive." In December 2012 Schiff wrote an article entitled "Mish Shedlock exposed" in which he criticized Shedlock for selective use of short-term data in the financial crisis and argued that his investment strategy had made strong returns over the long-run. Schiff's views have been criticized several times by economist Paul Krugman, who defines inflation very differently from Schiff, focusing on CPI increases, rather than monetary and asset price inflation, which Schiff believes eventually lead to increases in consumer prices after an indefinite waiting period. In October 2010, Krugman wrote, "I keep being told that Peter Schiff has been right about everything; so, how's that hyperinflation thing going?" In December 2011, Krugman quoted Peter Schiff's statement from December 2009: "I know inflation is going to get worse in 2010. Whether it’s going to run out of control or it’s going to take until 2011 or 2012, but I know we’re going to have a major currency crisis coming soon. It’s going to dwarf the financial crisis and it’s going to send consumer prices absolutely ballistic, as well as interest rates and unemployment." Krugman noted that inflation had instead remained low and concluded that Schiff's type of economic "model is all wrong" since it predicts that a tripling of the monetary base, such as had just occurred, must lead to "dire effects on the price level." In January 2012, Schiff stated that a US debt crisis and high consumer price inflation had been delayed merely by government policy. In November 2012 and again in November 2014, Krugman repeated his criticisms of Schiff's predictions of eventual high consumer price inflation and rising interest rates in America. In November 2008, Schiff said he supported the reduction of government economic regulation and was concerned that the Obama administration might instead increase such regulation. Schiff says that the late-2000s financial crisis provides an opportunity to transition from borrowing and spending to saving and producing. He is critical of the US government's efforts to "ease the pain" with economic stimulus packages and bailout, as he believes that replacing "legitimate savings with a printing press" would result in asset price inflation, eventual consumer price inflation, and if left unchecked, could potentially result in hyperinflation. For example, in 2009, Schiff predicted a "protracted period of economic decline accompanied by rapid increases in consumer prices." Schiff's critics point out that although asset price inflation has been significant, consumer price inflation rates have remained very low in the five years that followed despite his predictions. When the Fed ended the Quantitative Easing program in October 2014, the general opinion was the Fed is about to conduct multiple rate hikes in the year 2015. In contrast, Schiff predicted that the market cannot withstand even a minor interest rate increase, thus the Fed announcing a higher rate will be very unlikely. However, he did open up the possibility of a few basis point rate hike but anticipated that it will have major impact on the equity market and will lead the US into recession, therefore the Fed will be forced to reverse its policy way back to resuming the QE program. Schiff was an economic adviser to Ron Paul's 2008 presidential campaign. In support of Paul's economic revitalization plan, Schiff said, "We need a plan that stimulates savings and production, not more of the reckless borrowing and consumption that got us into this mess in the first place. Ron Paul's plan is the only one that amounts to a step in the right direction. If you want meaningful change—for the better that is—Ron Paul is the only candidate capable of delivering it." In December 2008, some Connecticut citizens created a website encouraging Schiff to campaign against incumbent Senator Christopher Dodd. Approximately 5000 people made campaign contributions using the web site. On February 21, 2009, a moneybomb raised over $20,000 for Schiff's campaign. In a May 2009 video blog, Schiff said that he was seriously considering a run for the Senate, and when questioned by a Washington Post reporter, he said the chance of him entering politics was "better than 50-50." In June 2009, Schiff commissioned a poll of likely voters which indicated that he trailed Dodd in popularity by only four percentage points. On July 9, 2009, Schiff launched an exploratory committee and an official campaign website. In a campaign speech in Hamden, Connecticut, on December 3, 2009, Schiff said, "Unlike everybody else, I pretty much predicted everything that would happen in 2008 in specific and exact detail.... Somebody needs to be in Washington to prevent the next round of [government] stimulus from taking place, because that will be the end of it. That will be the toxin that completely destroys the economy." After giving some hints on The Daily Show, Schiff officially announced his candidacy for the Republican nomination on September 17, 2009 during the MSNBC Morning Joe show. By October 2009, Schiff had received more than 10,000 donations and many e-mails from around the world. Schiff's campaign received endorsements from Ron Paul and Steve Forbes. At the May 2010 Republican convention, Linda McMahon received the most delegate votes but not enough to prevent an August primary election from Rob Simmons. Schiff failed to qualify for the primary at the convention but became the only Republican candidate to successfully petition on to the ballot. McMahon won the primary with 49% of the vote. Simmons came in second with 28% of the vote, and Schiff came in third with 23% of the vote. The general election was won by the Democratic Party primary winner, Richard Blumenthal. In April 2008, Schiff endorsed Murray Sabrin for the US Senate seat in New Jersey. Schiff did not endorse McMahon in the 2012 Republican primary but rather her opponent, former Representative Christopher Shays. Shays lost the primary to McMahon, who lost in the general election to Democrat Chris Murphy. Schiff broadcasting his radio show from Washington, D.C. in March 2013. From 2005 to 2010 Schiff hosted a weekly short-wave radio show named Wall Street Unspun, which featured commentary on financial market activity. From October 2010 to September 2014, he hosted The Peter Schiff Show broadcast on Internet and terrestrial radio. The show featured commentary on market activity, current events, and economic philosophy; it had many notable guests including Ron Paul, Rand Paul, Niall Ferguson, Dennis Kucinich, Rick Santelli, and John McCain. The Peter Schiff Show guest-hosts included Thomas Woods, Neeraj Chaudhary, Stefan Molyneux, Larry Elder, and Andrew Schiff, Peter Schiff's brother. According to his brother and public relations director, Andrew, Peter frequently appeared on CNBC, Fox News and Bloomberg to voice his opinions on the US economy and financial markets. However, after the financial crisis, his bookings dropped by 75 to 85% on these networks. In August 2012, Peter Schiff replaced G. Gordon Liddy in the 10 a.m.–12 p.m. time slot on the Radio America network Internet broadcast. Schiff no longer hosts a radio show. Schiff is also a video blogger in the internet and distributes his media through YouTube, Euro Pacific Capital, and iTunes. Peter Schiff has appeared three times as a guest on Joe Rogan's YouTube series and podcast. Schiff is often a commentator on CNBC and Fox Business. Schiff is a frequent guest on Boom Bust. Schiff has been the subject of criticism in regard to predictions he has made, and in particular for his repeated claim that in foreseeing the stock market crash of 2008-2009, he "positioned his clients accordingly". Schiff has testified before Congress twice, in September 2011 and June 2012. Peter Schiff is the author of six books published by John Wiley & Sons. His book, Crash Proof 2.0, appeared on both the New York Times and the Wall Street Journal bestseller lists. ^ "About Peter Schiff". Schiff Radio. Retrieved November 22, 2014. ^ a b Europac.net – Peter Schiff. Retrieved November 3, 2010. ^ "About Euro Pacific Capital". Euro Pacific Capital. Retrieved January 15, 2011. ^ "SchiffGold – Our Team". SchiffGold. ^ a b "Euro Pacific Capital | Weekly Radio Broadcast". www.europac.net. Retrieved March 4, 2009. ^ "Wall Street Unspun with Peter Schiff Podcast". podfeed.net. ^ "Anti-Tax Advocate Receives 13 Years". The New York Times. February 25, 2006. Retrieved July 23, 2013. ^ "Peter Schiff Announces Bid for US Senate" (Press release). Peter Schiff for Senate 2010. September 17, 2009. Archived from the original on June 26, 2015. Retrieved November 17, 2009. ^ Swanson, Tim (April 21, 2008). "Interview with Peter Schiff". Ludwig von Mises Institute. Retrieved April 11, 2010. ^ Gattoni-Celli, Luca (October 2015). "TAX PROTESTER IRWIN SCHIFF DIES IN PRISON AT 87". Tax Notes Today (2015 TNT 202-4). ^ a b O'Keefe, Brian (January 23, 2009). ": Oh, he saw it coming". Fortune. Retrieved April 14, 2010. ^ "Company Profile - Euro Pacific Capital". www.europac.com. March 27, 2018. ^ "Peter Schiff's Euro Pacific Bank Introduces a Silver Backed Debit Card – DGC Magazine". DGC Magazine. 16 August 2016. Retrieved 2 August 2018. ^ Inc, Euro Pacific Intl. Bank. "International Banking and Brokerage - Euro Pacific Bank". ^ "Expansion Continues - Euro Pacific Capital". europac.net. ^ Reinhart, Carmen M.; Rogoff, Kenneth S. (2009). This Time Is Different: Eight Centuries of Financial Folly. New Jersey: Princeton University Press. p. 160 (see table 10.8). ISBN 978-0-691-14216-6. ^ a b Schiff, Peter D.; Downes, John (February 2007). "Crash Proof: How to Profit from the Coming Economic Collapse". New Jersey: John Wiley & Sons. ISBN 978-0-470-04360-8. ^ Schiff, Peter (2009). Crash Proof 2.0. John Wiley & Sons. p. 316. ISBN 978-0-470-47453-2. ^ Wallison, PeterJ. (December 9, 2008). "What Got Us Here?". Aei.org. Retrieved May 1, 2010. ^ This American Life (May 1, 2010). "NPR – The Giant Pool of Money". Pri.org. Archived from the original on April 15, 2010. ^ "Peter Schiff's accurate forecast of credit card market trouble". Video.google.com. Archived from the original on June 29, 2011. Retrieved May 14, 2012. ^ Blodget, Henry (September 25, 2009). "Peter Schiff: U.S. Stock Rally And Dollar Doomed, Gold Going To $5,000". Business Insider. Business Insider, Inc. Retrieved March 6, 2014. ^ "Peter Schiff : How does a minimum wage requirement impact an economy? / Clear, concise arguments and answers from leading thinkers / Eristical.com". eristical.com. ^ "Disabled workers left in the cold on minimum wage". ^ Gettys, Travis (January 29, 2014). "CEO tells Daily Show 'mentally retarded' could work for $2: 'You're worth what you're worth'". The Raw Story. Retrieved February 1, 2015. ^ Gongloff, Mark (January 31, 2014). "Rich CEO Wonders Why 'The Daily Show' Hates The, How You Say, 'Retarded'". The Huffington Post. Retrieved October 30, 2014. ^ Perlberg, Steven (January 29, 2014). Peter Schiff And Barry Ritholtz Battled Over The Minimum Wage On Last Night's Daily Show. Business Insider. Retrieved January 31, 2014. ^ Peter Gorenstein (March 28, 2011). "PETER SCHIFF: The US Should Abolish Corporate And Personal Income Taxes". Business Insider. ^ "Peter Schiff: Growing Problems Leading To U.S. Dollar Crisis". ^ "Schiff: Ryan Budget Doesn't Go Far Enough". Fox Business Network. August 14, 2012. ^ Peter Schiff (July 18, 2013). "The Powerful Case for Silver". StreetInsider.com. ^ a b c Kyle Torpey (21 May 2014). "Peter Schiff Embraces Bitcoin at Euro Pacific Precious Metals". CryptoCoinsNews. Retrieved December 12, 2014. ^ Kyle Torpey. "Peter Schiff: Bitcoin Merchants Will Hurt the Price". Cryptocoinsnews. Retrieved December 12, 2014. ^ Alex Rosenberg (November 12, 2013). "Bitcoin is tulip mania 2.0 – not gold 2.0: Schiff". CNBC Futures Now. CNBC LLC. Retrieved December 12, 2014. ^ Peter Schiff (February 20, 2009). Peter Schiff was right 2006–2007 – CNBC edition (Flash) (Television production (clip compilation)). Retrieved April 14, 2010. ^ Peter Schiff (November 2, 2008). Peter Schiff Was Right 2006–2007 (2nd Edition) (Flash) (Television production (clip compilation)). Retrieved April 14, 2010. ^ Coy, Peter (June 2009). "What Good Are Economists Anyway?". Bloomberg News. Retrieved April 22, 2010. ^ Task, Aaron (November 24, 2008). "'Crisis Only Just Beginning': Right About the Crash, Peter Schiff Sees More Pain Ahead". Yahoo! Finance. Retrieved April 14, 2010. ^ Pressler, Jessica (September 17, 2009). "Financial Pundit Peter Schiff Launches Senate Run". New York Magazine. Retrieved April 16, 2010. ^ Shedlock, Michael (January 25, 2009). "Peter Schiff Was Wrong". Retrieved May 21, 2010. ^ Patterson, Scott; Slater, Joanna; Karmin, Craig (January 30, 2009). "Right Forecast by Schiff, Wrong Plan?". Wall Street Journal. ^ Shinkle, Kirk. Peter Schiff Responds, U.S. News, January 30, 2009. Retrieved September 5, 2009. ^ Task, Aaron (February 6, 2009). "Peter Schiff: Why I'm Right and My Critics Are All Wrong". Yahoo! Finance Tech Ticker. Archived from the original on 2009-02-08. Retrieved May 21, 2010. ^ Schiff, Peter (February 10, 2009). "Our Investing Plan Is Right, if Slightly Ahead of the Times". Wall Street Journal. ^ Scott Patterson, Joanna Slater and Craig Karmin (January 30, 2009). "Right Forecast by Schiff, Wrong Plan?". The Wall Street Journal. ^ Paul Krugman (October 4, 2010). "Math, Models, and Mystification". NYTimes.com. ^ Paul Krugman (December 15, 2011). "Inflation Predictions". The Conscience of a Liberal. NYTimes.com. Retrieved April 21, 2012. ^ Blodget, Henry. "Peter Schiff: The Debt-And-Inflation Crisis Is Taking Longer Than I Thought, But We're Still In Trouble". Daily Ticker. Yahoo Finance. Retrieved September 26, 2012. ^ Paul Krugman (November 29, 2012). "Varieties of Error". NYTimes.com. ^ Paul Krugman (November 22, 2014). "The Wisdom of Peter Schiff". NYTimes.com. ^ "The Reagan Counterrevolution - Euro Pacific Capital". europac.net. ^ "5 November 2008". Wall Street Unspun. 2008-11-05. ^ Vinik, Danny (November 20, 2014). "Inflation Paranoia Will Never Die, No Matter What the Evidence Says". The New Republic. Retrieved June 23, 2015. ^ Schiff, Peter (Jul 16, 2015). "CNBC Futures Now". Retrieved February 27, 2016. ^ "Peter Schiff Named Economic Advisor to the Ron Paul 2008 Presidential Campaign". Reuters.com Online News. Reuters. January 25, 2008. Archived from the original on October 15, 2008. Retrieved October 8, 2008. ^ a b c d Ahran, Frank (October 4, 2009). "Hard-Core Free-Marketeer A Conversation With Peter Schiff: Investor, Critic, Candidate". Outlook & Opinions. Retrieved October 3, 2009. ^ "Peter Schiff Money Bomb a Success!". Dailypaul.com. Archived from the original on February 25, 2009. Retrieved May 14, 2012. ^ "Analyst Who Predicted Meltdown Leaning Towards Challenging Chris Dodd". theplumline.whorunsgov.com. May 26, 2009. Retrieved May 29, 2009. ^ "Survey: Peter Schiff Competitive With Chris Dodd, Rob Simmons" (Press release). Wilson Research Strategies. July 1, 2009. Retrieved November 17, 2009. ^ Peter Schiff P1 Hamden, CT 12-3-09. YouTube. December 4, 2009. ^ Cadei, Emily (June 10, 2009). "Schiff Discusses Potential Dodd Challenge on Daily Show". Congressional Quarterly. Archived from the original on April 20, 2010. Retrieved February 5, 2010. ^ Peter Schiff, Joe Scarborough (host) (September 17, 2009). Peter Schiff formally announces his candidacy for U.S. Senate (Television production). New York City: MSNBC. Archived from the original (Flash) on 2013-08-14. Retrieved April 11, 2010. ^ Peter Schiff (September 17, 2009). It's official, I'm in (Flash) (Video blog). SchiffReport. Retrieved September 20, 2009. ^ "Ron Paul Endorses Peter Schiff and Rick Torres". ronpaul.com. ^ "Peter Schiff snags a big-name endorsement". courant.com. ^ "Lauretti to petition, potentially forcing 7-way GOP primary". The CT Mirror. Retrieved 13 May 2018. ^ Neil Vigdor and Brian Lockhart (August 11, 2010). "McMahon sweeps to victory in GOP Senate race". Connecticut Post. Retrieved August 11, 2010. ^ "Democrat Blumenthal wins Conn. Senate seat". The Washington Post. November 3, 2010. ^ "Paul stumps for Sabrin in Newark". PolitickerNJ.com. April 28, 2008. Retrieved October 17, 2008. ^ "Peter Schiff Endorses Chris Shays for Senate". Wilton, Connecticut Patch. ^ Grynbaum, Michael M. (August 14, 2012). "Linda E. McMahon Wins Connecticut Senate Primary". The New York Times. ^ Justin Fox (June 1, 2009). "Why We Should Listen to Peter Schiff's Bad News". Time. ^ Schiff, Peter. "SchiffReport". Youtube. Retrieved 4 September 2016. ^ Schiff, Peter. "Multimedia". Euro Pacific Capital. Retrieved 4 September 2016. ^ PowerfulJRE (August 23, 2017). "Joe Rogan Experience #1002 - Peter Schiff" – via YouTube. ^ Diaz, Amanda (March 17, 2015). "Forget patience, QE4 is coming: Peter Schiff". ^ "Schiff on China and the threat of encryption". RT International. ^ "The Peter Meter: Assessing Schiff's predictions". 2015-12-20. Retrieved 2018-01-26. ^ "Peter Schiff Was Wrong". 2009-01-25. Retrieved 2013-10-23. ^ US Government Publishing Office, gpo.gov (September 13, 2011). "THE PRESIDENT'S PROPOSAL TO STIMULATE THE ECONOMY AND CREATE JOBS". Retrieved July 12, 2015. ^ US Government Publishing Office, gpo.gov (June 7, 2012). "OVERSIGHT OF THE FEDERAL HOUSING ADMINISTRATION'S MULTIFAMILY INSURANCE PROGRAMS". Retrieved July 12, 2015. 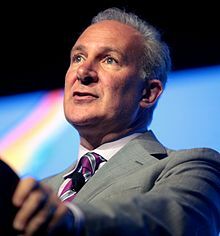 Wikimedia Commons has media related to Peter Schiff. This page was last edited on 8 April 2019, at 04:37 (UTC).